Hours & Rates Group Events Questions? Get in touch. Outer space. Into the future. The post apocalyptic world. Where it takes you is up to you! 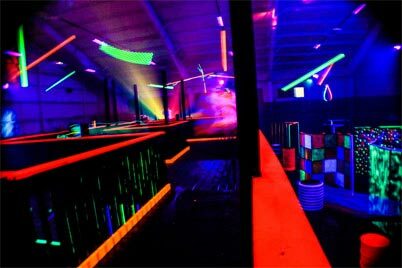 Playing laser tag at the area’s largest facility will transport your party to a different time and place, where shelters are obstacles, and vantage point viewing could be catastrophic. This blackened unlit space, marked only by glowing graphics, is the perfect setting for a friendly family rivalry, a high school after-hours, a scouting troop field trip, a team-building corporate retreat, or birthday bash. Check out some visuals here and then start getting your team ready! At Funagin’s we make sure you have everything you need to be armed and dangerous in our laser tag field. Vests, phasers, and all the mazes, obstacles, and hiding places you want! Have the Coolest Birthday Party EVER! *All Rates are plus Tax We don’t allow any outside food or drink. We ask for a $50 non-refundable deposit when booking your reservation, which will be applied to your overall charge. Call us at 419-517-1750 for additional options and we’ll help you plan the perfect party! We can accommodate groups both big and small for any occasion. For Groups of 20 or more, Please call us at 419-517-1750 for reservations.